I often pondered such questions during every Sharks game over the last couple weeks, each one streaming live to my computer, while pulling post-midnight working excursions for the last month. During my last update to The San Jose Blog, I finished updating the San Jose faithful on the wonderful, excellent chemistry the team has had during the month of January. Evidently, my increased workload translated to the subsequent seven game long losing streak – right? Actually, no. My fiancé kindly pointed out my “lucky” black and teal colored toe nails she painted for me while I was in my hospital bed had the polish wear off, effectively washing away the “luck.” I allowed her to re-paint them Monday night when I returned home super late from work, and sure enough, in the Sharks’ follow-up battle against the St. Louis Blues (a good team, I might add) – the Sharks won. It helps to listen to what some of the players have to say about their playing. Quite interestingly, it is fun to hear the players dispel what critics and commentators say. In particular, many commentators have noted the Sharks’ lack of speed, especially against the Chicago Blackhawks, as a particular hindrance to their playing abilities. What some have mentioned – and have been RIGHT about – is the lack of effort (i.e. work ethic) and getting quality shots to the net. While I can almost guarantee that any puck on Joe Thornton’s stick cannot be whisked away, unless it’s to a teammate’s stick, the important factor is to whom Thornton is passing the puck, and more importantly, where the puck recipient is standing. All too often, a puck getting shot from a Sharks stick is from a bad angle, and unless everyone on the team can snipe as proficiently as Logan Couture, goals are a rarity. The NHL has evolved to a much different level, with teams finally understanding that putting up a strong fortification is often times the formula for winning championships. As I’ve mentioned before, look at many of the past Stanley Cup winners. Have any of them been known as offensive teams? I’m betting none were. Look at the new, more widespread statistics, such as blocked shots and takeaways. In addition, look at the new defensive strategies of giving players no way to get a clean shot on net. Such strategies were integral in some of the rule changes (e.g. eliminating the play stoppage due to a two-line pass), giving teams a more difficult time to defend. The team that seems to have the defensive strategy down to a true art is the Nashville Predators. Granted, the Sharks had a terrible beginning to February, including dropping two games to the Predators, but the lack of the Sharks’ scoring production can be put squarely on the shoulders of some of the best defensemen in the league, and who many say is currently the best goaltender in the league (Pekka Rinne). Historically, the Sharks have struggled to put up points against the Predators for those reasons alone. In recent years, the Predators have been dark horse playoff contenders, and based on their style of play, there is no question how they made it. It is only their lack of significant offense that have kept them from making it far. 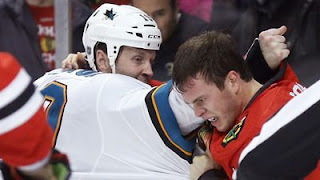 Fortunately, the Sharks have true ice sense and skill in their corner. The debate about how younger, fresher players make better teams and/or that having superstars on a team makes them better has swiftly been disproven multiple times, season after season. Two teams – the Edmonton Oilers and the New York Rangers – while fine teams on their own, are the epitome of teams with young, fast players, and loaded with superstars. Based on these factors, one may expect these teams to be at the very top of the league’s standings. It is however, evident that is not the case. The teams with the best ice sense and the teams with the best defense typically fare the best. This is what the Sharks need to capitalize on – their veteran leadership and ice sense. Tonight, the Chicago Blackhawks hope to make history by not having a regulation loss after tonight’s performance. Their opponent? The Sharks. The Blackhawks are a very beatable team. They have simply made it this far due to hard work and determination. It’s evident when watching them play, they have the ability to never give up, and can put massive pressure in the offensive zone. It is up to the Sharks to keep the puck out of their defensive zone and to maintain offensive pressure – something time and time again they have proven to be good at. Niemi needs to be on top of his game. Sure, there are some shots that cannot be stopped, but all other shots need to be kept from going in (especially no weak shots that can sneak by). The forwards need to get, and stay, open. Lastly, the Blackhawks defense needs to be intimidated quite a bit, something executed primarily through massive offensive pressure. Unlike the Predators, the Blackhawks rely primarily on their offense (e.g. Patrick Kane, Jonathan Toews, Marian Hossa), so we must exploit their defensive line! We cannot afford to get caught with our heads down. With our last win, let us use that momentum. The Sharks are known to perform well when the momentum is going. We can not, and must not, let the Blackhawks win. The game tonight starts at 5:30pm Pacific time, and will be live from Chicago’s United Center. Tune (or stream) in for some action. We need this win – big time! I want to see posts like this about the Earthquakes. It's not fair/correct/proper to only highlight one team and not the other. If you can find someone willing to do these posts for the Quakes, then I would definitely be happy to talk to them. This has nothing to do with fairness, Jarrod is offering to post about the Sharks and I'm not going to say no to that because we don't have someone to post about the Quakes as well.